CD "Mike d'Abo" CD "The beat goes on" CD "Mike d'Abo Songbook"
Mike d'Abo is involved in two tracks of this CD: The Double Feature version of "Handbags And Gladrags"
I received from him that day, scared witless and telling me Andrew's 'heavies' were holding him at a multi story car park. to agree. Reluctantly I did, telling Oldham in the process that he was a pathetic, drug ridden, amteur Kray brother. Chris finally returned to the office, white as a sheet. I told him he was a fool, that Andrew was playing at bad boys. who's version I actually do really prefer. I would have dah the arse sued off me by Decca. Just lucky I guess. “There was a bitter dispute, but it’s all over now. There’s room for both of us in this big wide world”. 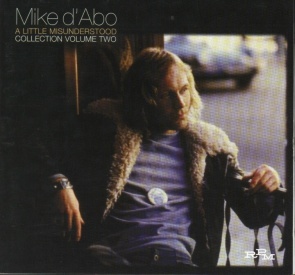 2004 has just started and Mike d'Abo announced his second CD release of the year 2004. After the "Hidden Gems & Treasured Friends" on the Angel Air label, Mike mailed me that President records will release a compilation CD of the best songs from "Indestructible" and "Tomorrow's Troubador" in May 2004, which were originally albums released on the President label in 1987 and 1988. 6. Velvet Glove 15. Whose Heart ? Tracks 1-12 are studio recordings from the period February 1971 until January 1973. Tracks 13-18 are from a live promotional concert at a radio station in Long Island/USA. All songs (except for the Bob Dylan song "The Mighty Quinn") are written by Mike d'Abo. Mike d'Abo got a call from Mo Foster, who played bass with him (and on the Smith & d'Abo album) in the past and he advised that whilst reviewing his tape storage, he had found various tapes, demos and acetates that they had recorded together in the early 70's. Mike painstakingly reviewed the 40 tracks seldom if ever previously heard. 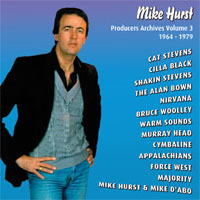 The tracks give a real insight into where Mike was, musically speaking, in the early 70's. Here track by track were the musical footprints of someone still searching for their true identity. 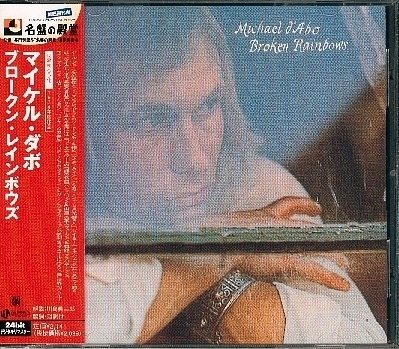 Mike said "Musically frustrated may be an overused term, but in my case, it's the best way to describe my state of mind in the aftermath of Manfred Mann, which disbanded in 1969. Glimpses of my song writing talents had already been revealed through "Handbags & Gladrags". Now the stage was set for me to deliver what I was capable of." 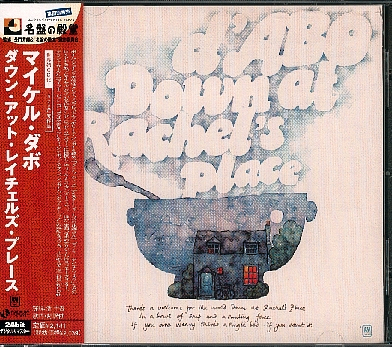 Following their 1972 tour of the USA, the d'Abo band returned to the UK to record what was supposed to be his next album, but due to management pressure after recording these tracks which now are released here for the first time, Mike recorded "Broken Rainbows" which was then released as his follow up to "Rachel's Place". Now at last "Hidden Gems & Treasured Friends" is released in all it's glory. The above story is printed as information on the record company's website www.angelair.co.uk. Mike already told me about this item when I last met him. He then also told me, that Mo Foster even had live tapes. Hopefully these will be found as well and released of course. On this album some well known songs from Mike himself, but also two that we already know by John Christie ("I'm A Ram" and "Relax") and lots of new songs. The album is certainly worth listening and it also has a nice booklet with beautiful pictures and stories on how Mike and his band (Affinity) worked in those days. Thank you Mike for adding the address of "The Mike d'Abo Website" in the booklet !!! Already in 2001 Mike d'Abo gave me a demo CD by his daughter Olivia, of which you will find the information a little lower on this page. She has a beautiful voice and I especially like her song "Broken". In the mean time Olivia is married with producer Patrick Leonard and besides producing Madonna CD's in the past, he now produced this Bon Jovi CD and Olivia's voice can be heard on the track "Livin' On A Prayer". By the way: the whole CD is worth listening to !!! Mike d'Abo played a demo version of this CD to me already in March 2003 which sounds very good. Of course the CD is only available at The Manfreds concerts, but if you are not able to go to one of their concerts, let me know and I will take care you get a copy. Paul sings on the tracks: 2, 4, 6, 8, 10, 12 and 13. Mike sings on the tracks: 1, 5, 7, 9 and 11. Paul and Mike sing on the tracks: 3 and 14. Mike d'Abo's career has enjoyed a considerable resurgence in recent years, due in no small part to the renewed interest of his best known songs from the 60's, "Handbags And Gladrags" and "Build Me Up Buttercup". 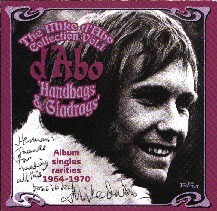 This collection of songs, which makes up Volume 2, (title is from another famous d'Abo songs as covered by Rod Stewart) is compiled from recordings he made from 1972 – 1976, and is a worthy sequel to The Mike d'Abo Collection Volume 1, which traced his early recording career from 1964 – 1970. Featured here is the absolute cream of no less than three of his albums from the 70's, "Down At Rachel's Place" (1970), "Broken Rainbows" (1974) and finally, "Smith & d'Abo" (tracks 16-20) (1976) – an album which brought together the twin talents of d'Abo and the former Dave Clark Five pianist and singer, Mike Smith. A bonus track is also included, "Stardust Serenade", previously only available in Japan, and released there as a single in 1974. All the familiar hallmarks of d'Abo's writing can be heard in this collection of songs. They conjure up images of a romantic dreamer, often treading a rocky path in search of spiritual fulfilment. Yet, in spite of setbacks, the message conveyed is one of hope. These images accurately reflect d'Abo's own recollections of those years back in the early 70's. RPM is a record company that released a great number of great items on 60's artists (look at their website !!! ), always accompanied by a great info sheet with lots of interesting information and great pictures. This CD will have six A Band Of Angels songs, all tracks of the "d'Abo" album, "Miss Me In The Morning" and "Cinderella Arabella" both from the Peter Sellers/Goldie Hawn film "There's A Girl In My Soup", and the never released Mike d'Abo song "Because You Are". Mark Stratford of RPM Records tried to include three songs that Mike wrote for Manfred Mann (Trouble And Tea/Box Office Draw/The Vicar's Daughter), but the record company on Manfred Mann wasn't cooperative, so these tracks had to be left out. But there's enough other songs to enjoy. The CD was officially released on Monday November 26, 2001, which also was the day I met Mike d'Abo to go to a concert of The Manfreds in Hayes/U.K.. The CD can easily be bought through the internet, but if you have difficulties in getting it, please contact me. The other day I spoke to Mike's wife Lisa, and she told me that RPM is interested in releasing "The Mike d'Abo Collection Volume 2". That is good news. Of course the sales of volume 1 are positively influenced by the big hit the Stereophonics had with Mike's song "Handbags And Gladrags", but that is only great for us Mike d'Abo fans. After "(Accept My) Invitation" on "Doing The Mod – Volume one" another A Band Of Angels song on a compilation CD from the Castle Music label. I already mentioned it on this page, but now finally I've received a copy of this CD. It's a straight copy of the album, with (unfortunately) no extra tracks. The inlay with the song lyrics and the handwritten song titles has been included in the CD version as well. And besides that, there is another inlay with (probably) the musical history of Mike d'Abo, but because it's written in Japanese, I really have no idea what they write. But because there are some pictures and some English song/album titles, I can guess what they are trying to say. The law in Japan say, that songs are protected for twenty years. After that anybody can release music without having to pay for the rights of the songs. So in this case a main record company (A&M) can release a CD without having to pay rights to Mike, which is a bit strange of course. 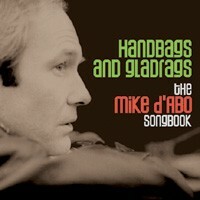 The third Mike d'Abo album can be bought on CD too. Also this CD is a straight copy of the original album, and also this time they included the English and Japanese song lyrics on a separate inlay. Only this inlay is a bit smaller and there are no pictures included by the Mike d'Abo story. Because of the title of the book that I'm writing ("The Music Of Smith & d'Abo") this is one of the most important releases of the year. The CD is only released in Japan and has the same tracks as the album. The CD release was announced quite early in 2001 and to be honest, I hoped that there would be at least one extra track included as so often happen with Japanese releases. 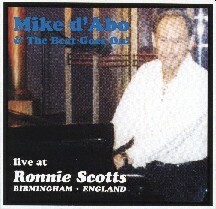 In June 2000 Mike d'Abo did five shows at the Ronnie Scotts club in Birmingham/UK, which he recorded. 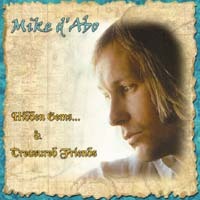 In February 2001 the CD "Mike d'Abo & The Beat Goes On! Live At Ronnie Scott" was finally available and you will be sorry if you don't order it now !!! During the show Mike played/sang songs from his whole recording career, like "Invitation" (A Band Of Angels), "King Herod's Song" (Jesus Christ Superstar), "Miss Me In The Morning" (from the "There's A Girl In My Soup" soundtrack), many Manfred Mann Songs and of course songs he wrote but which became famous by others artists like "Build Me Up Buttercup" (The Foundations) and "Handbags And Gladrags" (Chris Farlowe and Rod Stewart). When I stayed with Mike d'Abo in November 2001, Mike let me hear a promo CD by his daughter Olivia. The vocals and piano are played by Olivia d'Abo and the CD has been produced by Thomas Barquee. Mike also told me that there was a regular CD on it's way, produced by Olivia's new boyfriend Patrick Leonard who is famous because he produced several CD's by Madonna, but so far I haven't heard if it really happened. Especially "Broken" is a fantastic song. We played it over and over again. It sounds very much in the style of Madonna and then especially her CD "Ray Of Light". Olivia has a fine voice and I can imagine that she will easily score big hits. Another thing Mike d'Abo let me hear while I visited him in November 2001, was the song "Date With Destiny" of which he put two different takes on a CD-R for me. Mike found it was his final follow up to "Handbags And Gladrags". "Date With Destiny" is a ballad and on the promo you hear Mike singing and playing the piano and there is a full orchestral backing. Mike recorded it in the hope that someone else will record it. I like take 2 very much. A nice collection of music and clips. I was much surprised to see Mike d'Abo with two bonus tracks on the CD. Mike sings two newly recorded versions of "Handbags And Gladrags" and "Miss Me In The Morning", and his voice sounds better than ever !!! Also nice to see three clips of Manfred Mann with Mike d'Abo, because it is not easy to find things like that. "Semi Detached Suburban Mr. James" and "Just Like A Woman" and still in black and white, while "Fox On The Run" is a colour film in the style of a video clip (I didn't know Mike d'Abo could ride horses). On the DVD there are interviews with Manfred Mann between each song. 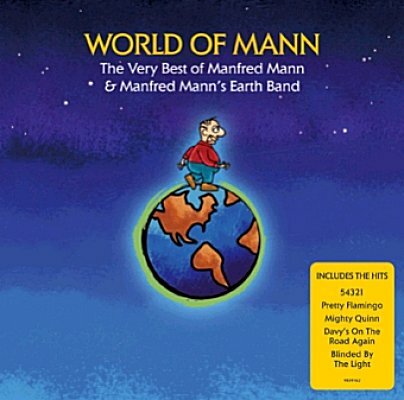 This really is something great, but you must not miss the 2CD "The Ascent Of Mann" with a lot of songs that were never released and the 2CD set from Australia "All Manner Of Mann", with also tracks by Mike d'Abo, Smith & d'Abo, Paul Jones, Mike Vickers, McGuinness Flint. Robert Lawrence from Halifax/Canada sent me an e-mail to tell me, that HMV Japan will release many Manfred Mann ablums like "As Is", "Mighty Garvey" and many more. The CD's are set for release on February 5, 2003. What's more to come ……………. in the future, and the record company RPM has shown interest in releasing volume 3, and that's good to know. All above mentioned CD's should be easy to buy through the internet, but if you have problems to buy them, please contact me and I'll see what I can do for you. So watch this site regularly !! !